To take SC4's tutorial on the quickest and easiest way to find a book using the online catalog, click on "How to Find Books Tutorial". SC4 Library uses the Library of Congress (LC) classification system, which uses a combination of letters and numbers (call numbers) to arrange the books. The LC system is one of the most widely used classification systems in the world, and it is conducive to browsing as books of the same topic are generally shelved together. Below you can see how the LC system's call numbers work, if you were to look at a shelf of books. Call numbers appear somewhat differently in the online catalog than on a book, as the below image demonstrates. Images: "KSP 106-Instructor: Vang Xiong." Minnesota State University Mankato, 19 Mar. 2018, https://libguides.mnsu.edu/c.php?g=455646&p=3113451. A Guide for Non-Catalogers Who Suddenly Find Themselves with a Cataloging Job ." Slideshare, LinkedIn Learning, https://www.slideshare.net/akroeger/kroeger-lcclassification. Shakalis, William. 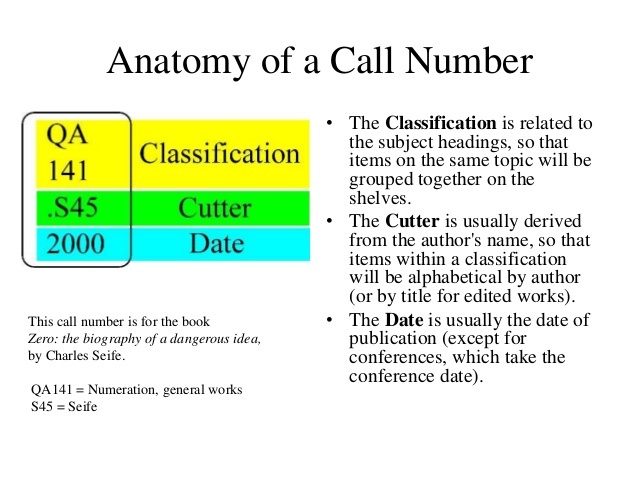 "How to Read Call Numbers." Worcester State University, 28 Nov. 2016, libguides.worcester.edu/c.php?g=537449. 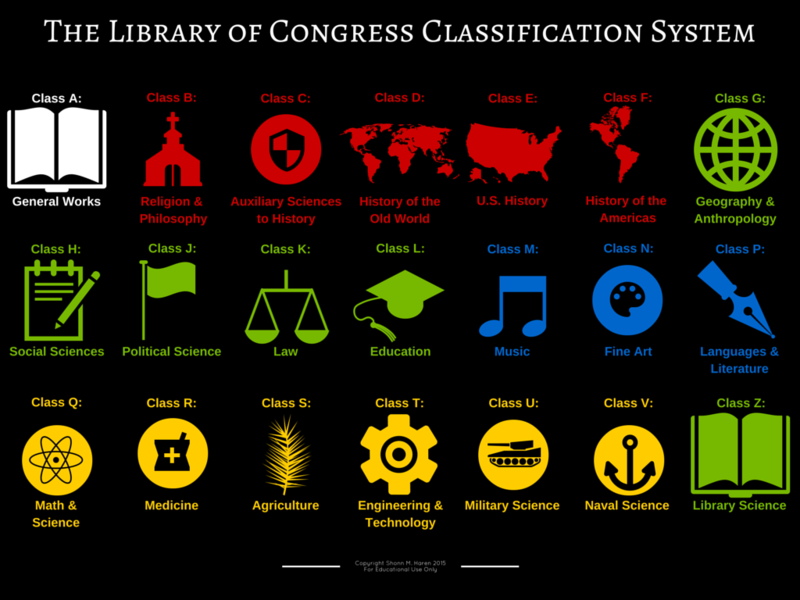 The chart below is a basic overview of the Library of Congress Classifications. With the Library of Congress system, books of similar topics are placed together on the shelves, which is more conducive to browsing. You may use OneSearch or the library catalog to find a particular book and go to the shelves to retrieve it, only to find a potentially much better book for your subject on the shelf next to the one you had originally found. 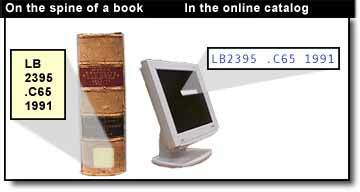 For more information on the LC system, visit the Library of Congress' website. Image: " English: An Infographic detailing the various disciplines covered by the Library of Congress Classification System." Wikimedia, 14 May 2015, https://commons.wikimedia.org/wiki/File:The_Library_of_Congress_Classification_System.png#filehistory. This file is licensed under the Creative Commons Attribution 4.0 International license.